This is a no guilt, good-for-you cookie made with real foods. Preheat over to 350oF. Line 2 large cookie sheets with parchment paper. In a small bowl beat together water and flax seeds. Add vanilla. Cream peanut butter and maple syrup, add flax seed mixture. Grind pumpkin seeds with a spice grinder into a fine meal. Using the same grinder, ground the 3/4 cups of oats into a flour. 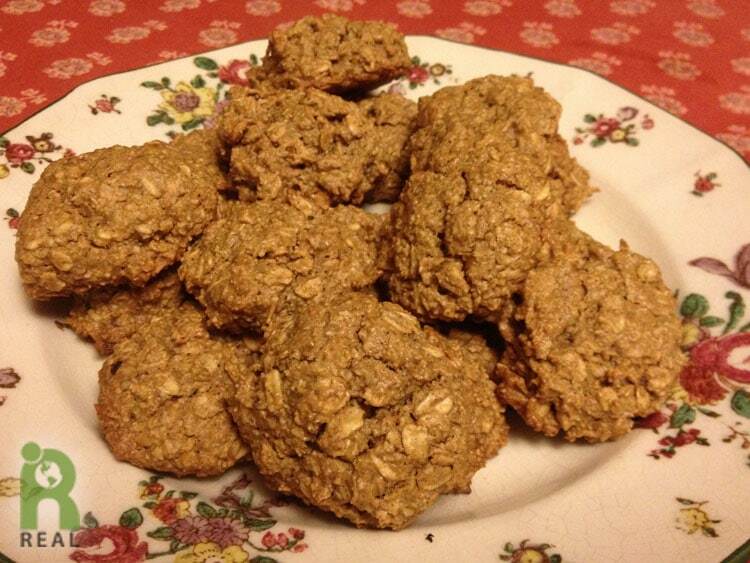 In a large bowl, mix together ground pumpkin seeds, oat flour, rolled oats, baking soda, and cinnamon. Add flax/sugar/peanut butter mixture and mix into a dough. The cookie dough can be used immediately or refrigerated. If using immediately, scoop out a small amount of dough, roll into a ball in your hands and flatten to a round circle. Place on the cookie sheet. Continue with remaining dough, leaving about 1/2 inch between cookies. If refrigerating dough, first roll dough into a log, about 2 inches in diameter. Wrap in wax paper. When ready to use, slice dough into 1/2 inch rounds and place on cookie sheet. Bake for 10 minutes until lightly browned. Remove from oven and allow cookies to cool completely on the sheet pan. Makes about 15 cookies. Note: Oat flour can be used in place of grinding rolled oats. My 23 year old daughter has convinced me to become a vegan. I will have to admit that I really do look and feel better!!!! !